USA & AUSTRALIA ONLY - Ignition only accepts Australian and American players. Ignition accept bitcoin and every major payment option: Credit Cards, Bank Transfers. 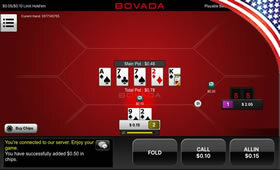 Ignition acquired Bovada poker, making it one of the busiest rooms for U.S. players. The minimum BTC deposit at Ignition is $20 and there is no processing fee. The minimum BTC payout is also $20 and is processed in 2 to 3 days free of charge. Ignition Poker games can be played on your iPhone, Android, Lumia or iPad. Rake at most of the games is 4% to 5% but they do have a generous loyalty program. ​They are regulated by one of the most trusted gaming commissions: Kahnawake. 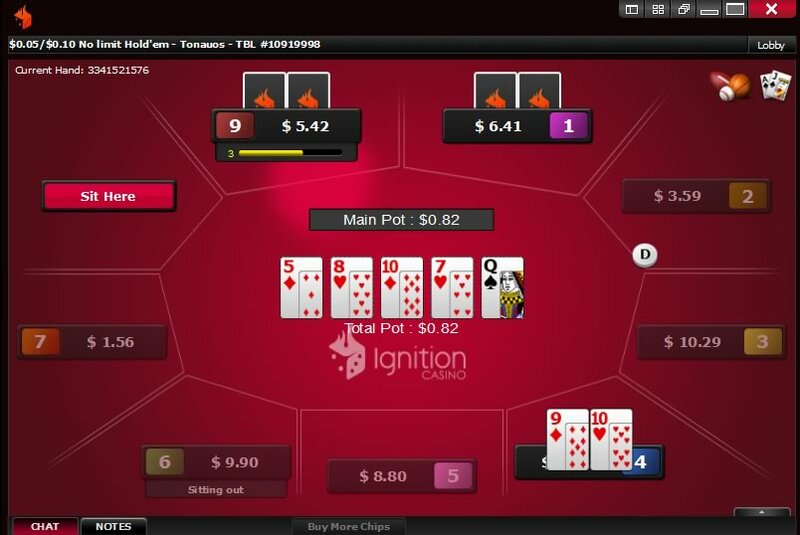 As Ignition's poker client proves, if it ain't broke, don't fix it. 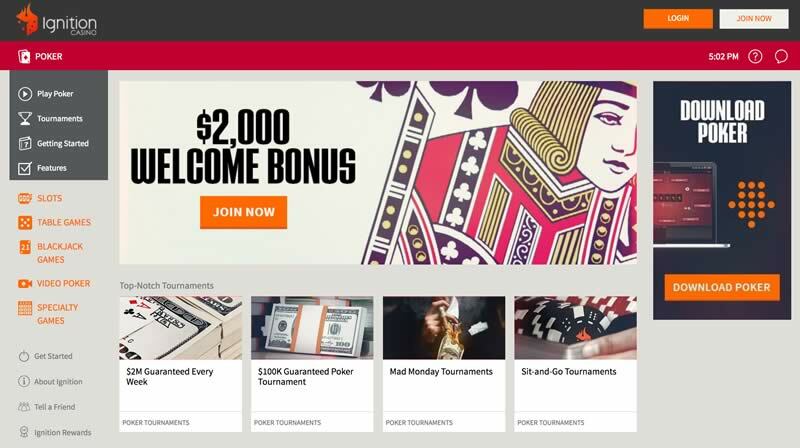 Making use of the same software that made Bovada so popular, users of the old site will feel at home with the same sharp graphics and clear layout. Experienced grinders can enjoy multi- table functionality and make use of the four-colour deck, while players looking for a social experience can use the in-game chat feature to converse with their opponents. Hand histories can be saved, allowing you to review your previous plays and develop strategies against particular opponents. As the name suggests, Ignition Casino is not just a cardroom. Users can play a variety of casino games – including Roulette, Blackjack, Baccarat, Slots and Video Poker. 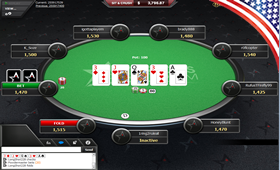 These games can be accessed within the poker client under the 'Casino Games' tab. Good news for mobile and tablet owners – Ignition is compatible with iPhone, iPad, Windows Phone and Android. 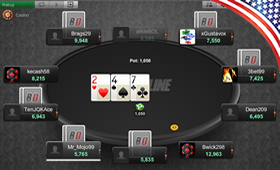 Though you are limited to only cash games and Zone Poker via mobile devices, this suits the platform well as you can easily dive in and out of games. All games have been optimised for easy navigation and play on mobile devices. 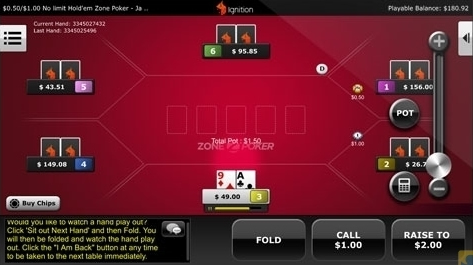 Ignition is one of the few options open to U.S. players who want to play poker on their tablet or smartphone. Depositing with bitcoin at Ignition is quick and easy. Deposits occur immediately and no fee is charged, while the minimum amount is $20 and the maximum limit is $5,000. Withdrawals are also free and typically take 2 to 3 days. The minimum that can be withdrawn is $20 and the maximum is $9,500, and users can make a withdrawal once every three days. 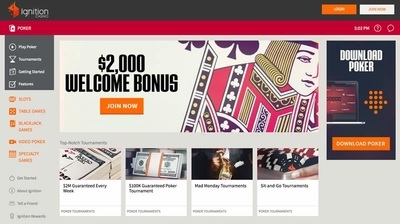 At Ignition, you'll benefit from some of the biggest bonuses on offer at any bitcoin cardroom. First of all, new users will be given a $1,100 welcome bonus on joining. On top of this, any deposit made with the popular crypto-currency will receive a 100% free casino money bonus on deposits equivalent to $1,000. They crypto poker room also offer a Bad Beat Bonus running on all cash games, and a rewarding loyalty scheme offering free prizes and cashback. If you need any help or have any questions regarding Ignition Poker, you can get in contact with the support team who are available 24/7 via e-mail at service@ignitioncasino.eu. If you have an urgent query that needs answering right away, a member of staff can be contacted anytime by calling 1-855-370-0600. 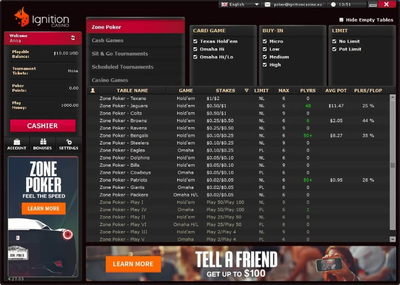 Poker at Ignition Casino is a great option if you are an online poker player in the United States. 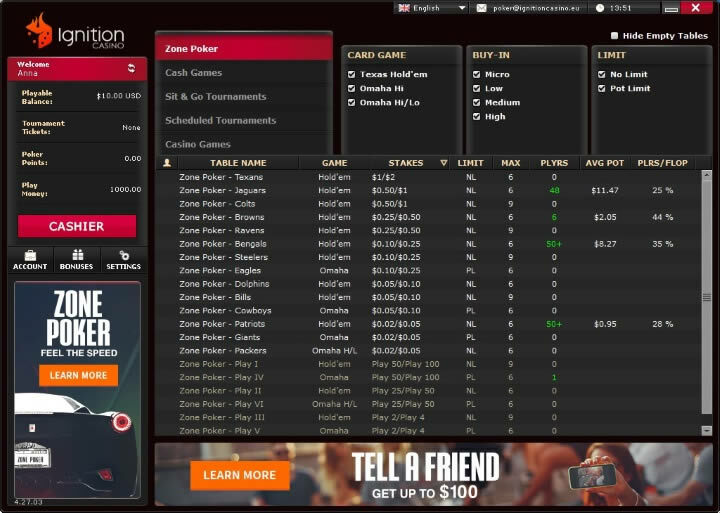 With the same cash games, tournament schedule and software as Bovada, lovers of the old site will be familiar with Ignition's layout, while new users will quickly warm to it. 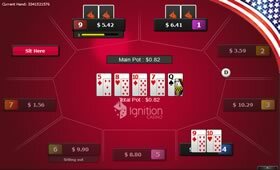 Bitcoin deposits and payouts are completely free and Ignition is one of the only US poker sites that is compatible with iPhone, Microsoft Lumia and Android devices like the Samsung Galaxy.